Book Review: CHILDREN OF ABRAHAM AT WAR » Ambassador Fabian’s blog, KP Fabian, Analyst - international political developments, global issues, Indian national issues. As I finished reading the book, I thought of two other books — Francis Fukuyama’s The End of History and Samuel Huntington’s The Clash of Civilizations. All three authors look for the big picture. Unlike the other two, however, the book under review is free from any trace of civilisational ego-centricism. Both Fukuyama and Huntington assume without providing much corroborating evidence the essential, inherent superiority of the western civilisation over others. Ambassador Talmiz Ahmed, currently posted to Saudi Arabia, is refreshingly free from such an ego-centric predicament, as historian Toynbee put it. Why is it that Ahmed is free and the other two are not? The answer is fairly simple. In addition to being an industrious scholar, the author has spent most of his 35-year career in West Asia. He has had the advantage of talking to a wide spectrum of people there, observing their behaviour and the interaction between the West and Islam. The thesis argued out by the author with commendable lucidity can be summed up in three parts. First, Jews, Christians and Muslims are Prophet Abraham’s children. Jews and Muslims lived without fighting for 1,400 years. Christians and Muslims have fought for centuries. There are three related concepts, often used interchangeably: Apocalypticism, Millenialism and Messianism. Apocalypticism refers to the belief in the imminent, total transformation of this world (the earthly kingdom) through divine intervention. Millenialism refers to the expectation of a radical break at the end of thousand years; in general, it refers to a period of chaos and destruction, culminating in redemption through divine intervention. Messianism refers to the expectation of the appearance of a divinely ordained saviour who will lead the believers in the war against evil and herald the millennium. Though found in all major cultures, these three concepts are central to Jewish and Christian traditions, and have a strong resonance in Islam as well, particularly in Shia Islam. Second, it is the conviction of the protagonists in the present-day messianic conflicts that their war with the “other” is a “millennial religious duty”. Early Christianity rejected war, but, a thousand years after Christ, the Pope himself instigated and blessed the Crusades. The militant Christian messianists, mainly in the United States, hold that Islam, monochromatic, unchanged across centuries, encompasses all aspects of the life of the believer, and is inevitably at war with the West. This belief is without any historical basis. Till the disastrous defeat in the hands of Israel in the 1967 War, there was a strong tendency in the Islamic world to accommodate the western, modern, secular values. The successful jihad in Afghanistan, funded by the US and Saudi Arabia and supported by Pakistan, gave a strong impetus to Islamic militant Messianism. Such Messianism is the product of specific contemporary political circumstances and opportunities provided by global and regional players — that after defeating one superpower, the militants turned on the other superpower and its allies, Israel and pro-West regimes in the Islamic world. The conflict between Islam and the West is not age-old civilisational war as argued by many western scholars. Though the Crusades ended centuries ago, the attitude of mind that started the war is still strong in the West. 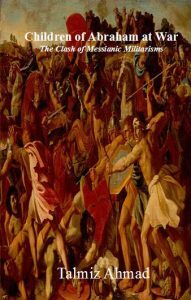 Third, in the Jewish tradition, the Jews fought against Rome in the first two centuries of the Christian era. For the next 1,800 years, there was no thought of any holy war in the Jewish mind though the return to the “promised land” remained a vibrant tradition. Twentieth century experience, including the Holocaust, prompted the emergence of militant Messianism among the Jews. The 20-century long animosity between Christians and Jews has been reversed and militant Christians fervently support Jewish militant Messianism. Thus, the stage is set for a renewed conflict among the children of Abraham who are united in drawing from their shared traditions new justifications and doctrines in support of animosity and war. Where do we go from here? Talmiz is rather optimistic. He concedes that the historical narrative of “hatred, conflict and war, of mistakes made and opportunities lost” might fill one with anguish and pessimism. The reason for the optimism is mainly the promise of Obama. Talmiz, in the final 14th chapter “The Way Forward”, argues that Obama’s initiative for reconciliation with Islam and the questioning of conventionally accepted myths in Israel by post-Zionist scholars justify the hope for the emergence of a “new era of dialogue, understanding and respect between the three brothers”. The reader might wonder whether Obama did not promise much more than he has delivered and might conclude that the recent collapse of the talks between Israel and the PLO, primarily resulting from Prime Minister Netanyahu’s insistence on building more in East Jerusalem, signals Obama’s limitations. The bibliography is impressive and the glossary is indeed useful. We might expect another book from the author a few years later on what has been achieved, if any, under Obama. But Ahmed’s historical narration of the genesis of the three militant Messianisms is of enduring value.